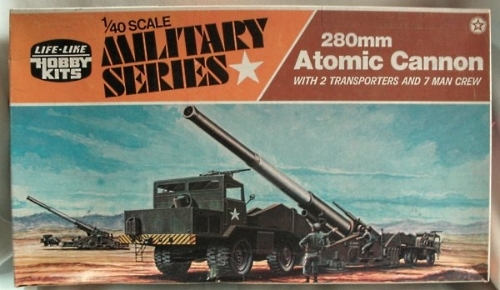 Below are images of the box art of some of the plastic model assembly kits produced from the 1950s to the 1970s, plus the brand new kit by DRAGON in 1/72 scale, released in 2015. If you buy this kit, you're going to need 1/72 scale drawings to super detail it. Check out the "ORDER DRAWINGS" tab on this website. Renwal, Adams, SNAP, and Life-Like are all out of business, now. None of these old plastic kits are currently in production, but they can be found (occasionally) on eBay and through internet dealers of rare and collectible model kits. The Revell re-release (2013) in somewhat the original packaging is generally still available. 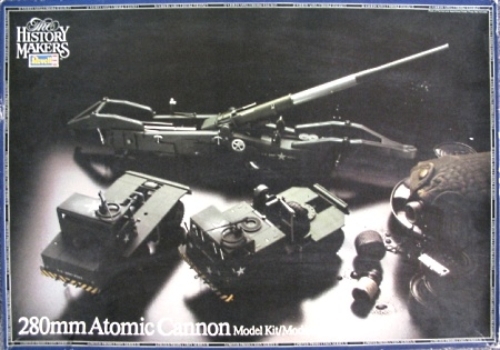 This plastic model assembly kit of the M65 is the first new kit release in fifty years. Overall, it is very detailed and well-molded, especially the two trucks, although the manufacturer made some interesting simplifications to the kit design, particularly at the gun and lifting forks: the crew platforms have been molded directly on to the sides of the gun carriage, as in the travel mode, and the lifting forks lack any surface detail on the sides. These issues can be fixed, but it will take some work. Hopefully, the accessory manufacturers are busy producing resin and photo etch detail sets to supplement the model. I'm sure a great model can be built from this kit, with or without additional detailing, and I'm very excited to see this subject out on the market. Click on the thumbnails below to see photos of the sprues from the kit. First made available in 1958, the Renwal kit is 1/32 scale. It was reissued in the 70s by Revell, as part of the "History Makers" series. This image has been digitally restored by the crew at theBoxartDen.com. 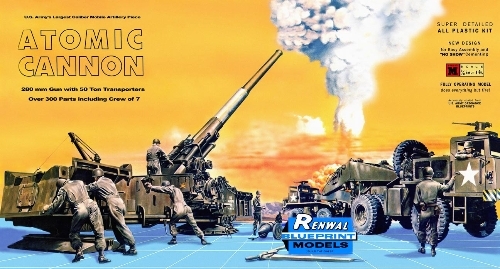 Revell Plastic Model Corporation re-released this Renwal kit, in something like the original boxart, as part of Revell's "Special Subjects Program," in September of 2011. 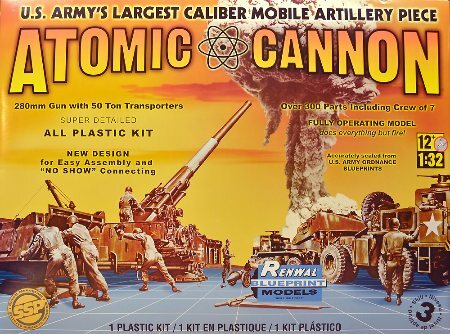 This is the box art for the Adams 1/40 scale Atomic Cannon plastic model kit, which was available in the late 1950s. 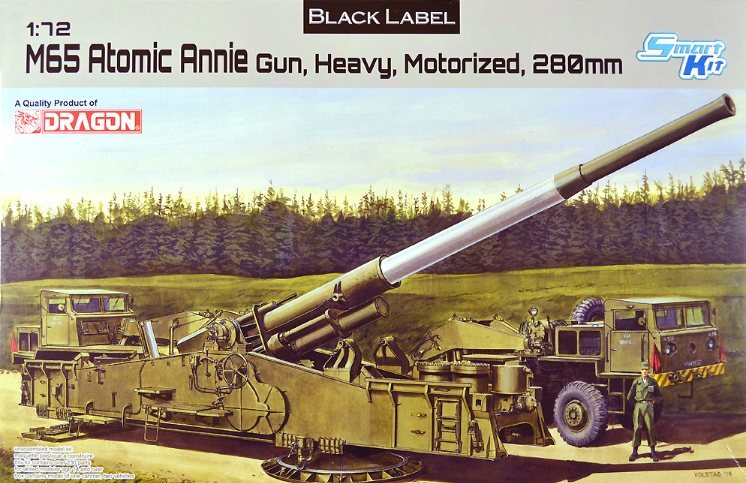 Note how the gun tube is depicted as fully deployed, even though the Rear Truck is not yet fully detached. 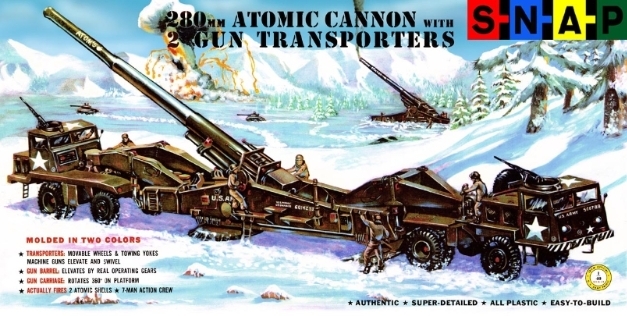 This is the box art for the Life-Like Hobby Kits reissue of the Adams 1/40 scale Atomic Cannon plastic model kit, available in the early 1960s. This is the box art of the Revell "History Makers" reissue in the 1970s of the Renwal 1/32 scale kit. Note how in the photograph of the assembled kit, the lifting forks are incorrectly attached to the gun carriage, instead of to the two trucks. Revell reworked the original Renwal box art in the 2013 reissue of the Renwal kit, adding more information in larger text and different fonts.